Folks headed from Santa Fe to St. Louis by wagon train trust the riders escorting them, tough hombres who proved their mettle by fighting off an Indian attack. Yet the riders are wolves in sheep's clothing. They're Confederate soldiers who aim to lead the wagon train and its cargo of Union gold into a Rebel ambush. The Outriders is about that journey... and of one man's journey from villain to hero. 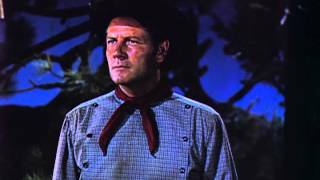 Joel McCrea plays the Johnny Reb whose change of heart is inspired in part by a lovely wagon train passenger (Arlene Dahl). Rugged men. Wide-open spaces. Sudden dangers. The hallmarks of the cinematic West are here. And topping them all is a daring river crossing that's "one of the best of its kind ever done on film" (Variety). MGM went into the western-programmer business relatively late in the game, but made up for lost time with such laudable efforts as THE OUTRIDERS. Joel McCrea stars as one of three Confederate soldiers who escape from a northern prison compound. The three men join a wagon train, hoping to capture a Yankee gold shipment to help their cause. When the wagoners are attacked by Indians, McCrea decides to reassess his priorities and protect the passengers--especially the stunning Arlene Dahl. THE OUTRIDERS was produced in the wake of MGM's surprise success with 1949's AMBUSH.